Bryzgalov’s professional career began in the 1998/99 season, when he played goaltender for the Lada farm club. His 1999/00 season began in Moscow with Spartak, where he played only 10 games before transferring to Lada’s first-tier team for a season-and-a-half. In 2000, Bryzgalov was named best new player of the season in the Russian Superleague. Despite receiving offers from many top Russian clubs, Bryzgalov decided to go overseas. As a member of the Mighty Ducks, however, he wasn’t able to play even four seasons straight: during the NHL lockout he played in the Cincinnati Ducks farm club. Bryzgalov spent the 2005/06 and 2006/07 seasons in Anaheim, playing 31 and 27 games, respectively. But the entire time, he was the back-up for goaltender Jean-Sebastien Giguère. Nevertheless, in 2007 Bryzgalov became the owner of a Stanley Cup championship ring. He attributed his success as a goaltender partly to his penchant for reading ancient Greek philosophers in his spare time. In November 2007, Bryzgalov was placed on waivers, and he was claimed by the Phoenix Coyotes. In his very first match with his new team, Bryzgalov made 27 saves for his third career shutout in a 1-0 win over the Los Angeles Kings. Within two months, he had signed a three-year contract with Phoenix worth $12.7 million. In 2010, Bryzgalov was a finalist for the Vezina Trophy, awarded annually to the National Hockey League goaltender “judged to be the best at this position”. In 2011, a month before his latest Phoenix contract ran out, he was traded to Philadelphia. 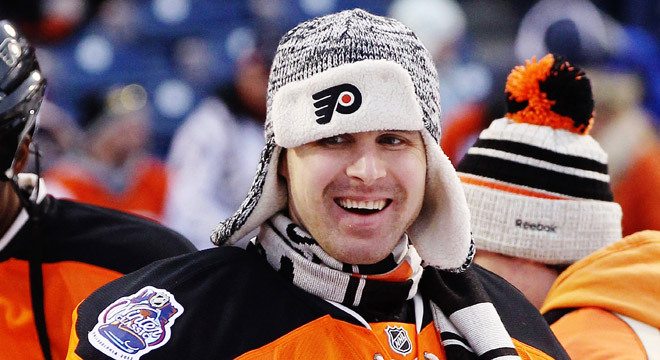 The Flyers signed Bryzgalov to a nine-year $51 million contract. He will be their new starter, alongside fellow Russian goaltender Sergei Bobrovsky. Bryzgalov is currently at the peak of his career. He holds the record for number of shutouts among NHL rookies; he won the 2007 Stanley Cup with Anaheim; he boasts the second-longest playoff shutout streak in NHL history. After eight years spent in the Anaheim and Phoenix systems, Bryzgalov is ready for stiff competition and knows that if something goes wrong, the goaltender may well have to take the fall. When he signed with the Philadelphia Flyers, he became the second-highest paid player in the NHL with a salary of $10 million (the highest paid player is New York Rangers forward Brad Richards). Although he was not one of the league leaders lately in terms of reliability and save percentage, he managed to put himself together and was named the NHL first star of March for his stellar performance - .in 13 starts, Bryzgalov went 10-2-1 with a 1.43 goals-against average, .947 save percentage and four shutouts. As a member of the Russian national team, Ilya won a Bronze Medal at the 2002 Winter Olympics in Salt Lake City; he also played on the Russian team at the 2006 Turin Games. His moment of glory came when he played for Russia at the IIHF World Championships in 2009. Ilya was the team’s principal goaltender and his brilliant play took the Russians all the way to the finals. In the ultimate battle against Canada, Bryzgalov made 36 saves and was named the best player of the game. Bryzgalov is married and has two children, a son and a daughter, who were born in the United States. Bryzgalov is interested in philosophy. His favorite thinker is Socrates. He is often thinks of Socrates’ debates with the Sophists while playing matches. His favorite place on earth is California. When in Russia, he takes taxis, but in Philadelphia, he drives one of his several BMWs. Bryzgalov finds he has little in common with his fellow players with the exception of Pavel Datsyuk, alternate captain of the Detroit Red Wings, with whom he can discuss Russian classics and German classical philosophy. Bryzgalov considers California the best place on Earth. “It is the best place to play hockey. You wake up every morning, go to work and the sun shines on you. No rain or minus 30 degrees cold. It’s a paradise for hockey, take my word for it,” he said.